Dating back to 1969, the first recipients for our scholarship program were for paramedic education. We started awarding scholarships to medical and dental students in 1978. In 2007 we added two master of public health scholarships and a nursing scholarship. We now offer financial support for Ph.D. students in biomedical science attending advanced short courses at prestigious institutions. We continue to offer merit awards for medical and dental students and have added educational travel money for graduate students. 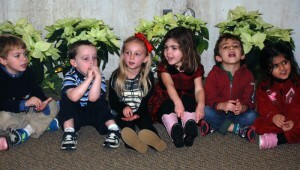 Students in the UConn Health Creative Child Center give a holiday concert in the main lobby. We opened what today is known as the Creative Child Center in 1977, making UConn Health one of the first state agencies to offer on-site child care to its employees. It started with a director, one teacher, two aides, a college student, a junior volunteer, and room for 25 children. We managed the child care center for nine years before securing a grant and building on campus and turning it over to UConn Health’s Department of Auxiliary Services, which provided the resources to continue the program. Formed in 1979, the Art Advisory Committee acquired 464 pieces of art for display throughout UConn Health. The collection since has been turned over to UConn Health and today totals more than 1,500 pieces of art, most of them donated. The paintings, sculptures, quilts, photographs and murals are on display and enjoyed by all the UConn Health community and patients. Our biggest project was to endow a chair in bioethics to honor Dr. Jay Healey, a much-loved teacher whose untimely death affected everyone who knew him. We raised $900,000 and it was matched to make the $1.5 million chair! We are probably the only Auxiliary nationwide to have accomplished this. This chair was filled in 2006. The UConn Health Auxiilary Patient and Family Education Center opened in 2015. The UConn Health Auxiliary Patient and Family Education Center is now open on the second floor of the Outpatient Pavilion. In 2013 we pledged $400,000 to make this resource possible. We continue to maintain a cancer survivorship program, designed to help cancer survivors and their families get back to their lives, and a patient assistance fund, intended to help cancer patients cover things like co-pays, medications, health insurance, travel expenses, groceries, utilities, rent/mortgage, and other such expenses. The newest and perhaps most exciting of our current undertakings is our NICU webcam program. 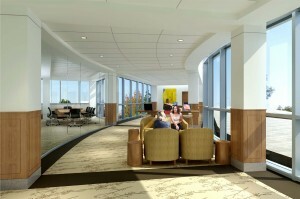 We have partnered with the Rotary Club of Farmington to equip the Connecticut Children’s Medical Center Neonatal Intensive Care Unit at UConn Health with webcams. When they’re unable to be with their newborns in person, parents will be able to see and hear their babies (and caregivers) via a secure web connection. This will allow parents (and family members they choose) to use a smartphone, tablet, or computer to bond with the neonate from anywhere. 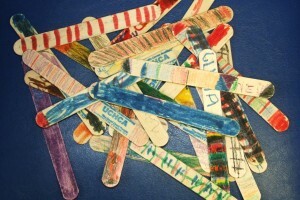 Participants from the Creative Childcare center designed tongue depressors as part of the American Mural Project. In 2008 we introduced The Family Place at Homewood Suites, offering free long-term accommodations for parents of newborns being treated less than a mile away in the NICU at UConn Health. One of the couples who called The Family Place home for several months shared their story. After the Connecticut Children’s Medical Center assumed management of the UConn Health NICU, the Auxiliary turned this program over to Connecticut Children’s, which has pledged to continue it. This service has been very well received since its inception. We are proud to have started it. In 2008 we also introduced WHALE, an acronym for “We Have A Little Emergency.” WHALE is a child safety seat identification system that provides emergency personnel at an accident scene with vital information about the child in circumstances when the driver is unresponsive. Connecticut Children’s Medical Center partnered with us on this program. In 1994 when we celebrated our 25th anniversary, a group of quilters made the wonderful quilt on display in the entrance lobby of the hospital. The quilt shows the many aspects of the UConn Health family. The Auxiliary also pledged that year to raise $250,000 for an endowment to provide loans for students here at UConn Health. We donated $50,000 to UConn Health to outfit a new laboratory in the Academic Research Building, and dedicated the new lab in 2001. In 2009 we joined the American Mural Project in its efforts to create the world’s largest indoor collaborative artwork, housed in Winsted. The “Wall of America” includes a sculpture made of individually painted tongue depressors. We helped raise money and awareness for this effort and contributed hundreds of tongue depressors designed by our Creative Child Care children. Over all these years we have overseen Auxiliary services such as patient television rental service, English as a second language classes, baby photo service, the Fuzzy Bear and Memory Box projects, a grant for diagnostic breast cancer workups for uninsured patients with mammographically detected suspicious breast lesions, and support for the mini medical school program. Other initiatives include equipping the first rescue truck, funding research laboratories and equipment, furnishing hospital rooms, and awarding money to fill various requests from almost every department and school at UConn Health.